In Part 1 of our 195 Street Grid posts, we looked at the Wickenden Street area and an alternate plan proposed by Ron Henderson of L+A Landscape Architecture. The design proposed by RIDOT was less than impressive, after feedback from the public and the Fox Point Neighborhood Association and others, the City Planning Department has requested that RIDOT review the alternate proposals prepared by Ron Henderson and a similar proposal prepared by Russell Preston of Cornish Associates. RIDOT will prepare one or two alternatives based on the public feedback and the Henderson and Preston proposals. These alternatives will be presented at a public meeting to be scheduled for some time in September. I have received a new draft prepared by L+A Landscape Architecture in consultation with The Fox Point Neighborhood Association, The Providence Foundation, and Cornish Associates. So, I do like this plan, it addresses much of the concerns brought up by the original RIDOT plan. There are just a couple little issues I have. The original RIDOT plan did not allow for pedestrians to cross from India Street (currently South Water Street at Corliss Landing) to the new proposed park along the river. Both the Henderson plan and this new draft do allow for this crossing. This new draft does not have an island on Point Street which Henderson’s first plan did. There are three lanes of traffic to cross at this point and I think the island is important to allow for a pedestrian refuge so that pedestrians don’t have to find a gap in both directions of traffic to cross in one swoop. Also, India Street is restricted to a right turn only at this intersection. Currently it has this restriction, but much traffic turns left anyway. I think the only way to enforce this right turn only is to put an island in Point Street to block India Street traffic from turning left. Personally, I like the idea of the ramp from Route 195 westbound meeting South Main Street at a right angle in line with Tockwotton Street. This would force ramp traffic into a typical city intersection and normalize expressway traffic to city street traffic. The RIDOT proposal and this new draft both have the ramp merging into South Main Street. This gives ramp traffic the ability to move at high speed into and (i the light is green) through the Wickenden Street intersection without normalizing to city traffic conditions. Not being a professional traffic engineer myself, I’m willing to defer to the experts and assume that having that right angle intersection will back too much ramp traffic onto the highway (though I would note that ramps all over the city and state have a configuration where they end at a traffic light). If the ramp must continue to merge, RIDOT should ensure that drivers get cues indicating that they should now be switching from highway to city driving. Rumble strips on the ramp would alert drivers to slow down; signage warning drivers of local traffic conditions and pedestrians should be installed; and the roadway sides should be built with curbing and landscaping and other cues that indicate the road is no longer a highway. Ramp issues aside, there continues to be an exclusive right turn lane where the ramp from South Main Street meets Wickenden Street. And exclusive right turn lane allows for right turning traffic to turn right on red without being stacked behind traffic that is waiting to proceed straight. Having the right turn lane makes the road three lanes wide, making for a wider gap for pedestrians to have to cross, and pedestrians will need to be vigilant of cars turning right on red. RIDOT could install signage prohibiting no turn on red, but I think experience shows us that RI drivers are not very good at obeying such signage. Simply not having the right turn lane eliminates the problem. With Gano Street having it’s own ramp, the amount of traffic coming off at South Water and turning right onto Wickenden should be minimal. There is also stuff to like about this new draft. Pike Street runs behind where the Coffee Exchange is between Brook Street and Traverse Street. 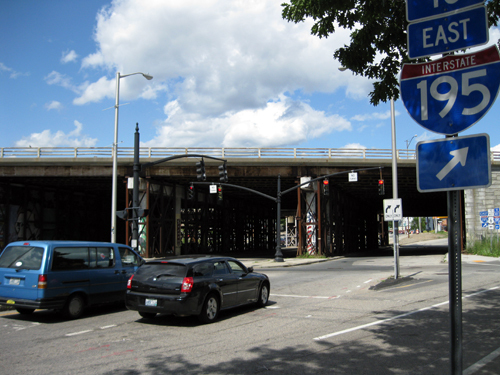 In the original RIDOT plan, the part of Pike Street which was abandoned under the highway between (future) South Main and South Water Streets comes back, however, it was not connected to the existing part of Pike Street. The ramp traffic on South Main Street was given priority not allowing Pike to reconnect to itself. In this draft, Pike is made whole. 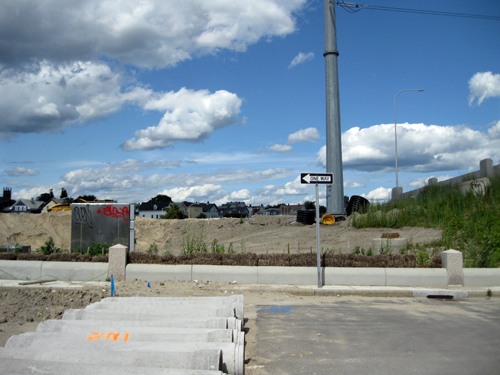 Having the Pike Street intersection between the ramp and Wickenden Street should also help to serve to normalize ramp traffic to city conditions. Cent Street is a historic street that ran between South Water and South Main before the highway was built on top of it. In the new draft, Cent Street is proposed as coming back. Cent Street can either be a street, or a pedestrian plaza. Making it a street allows it to provide more on street parking for area retail, a pedestrian plaza is a very attractive option though, imagine DePasquale Plaza on Federal Hill. We’ll see what RIDOT proposes in September. 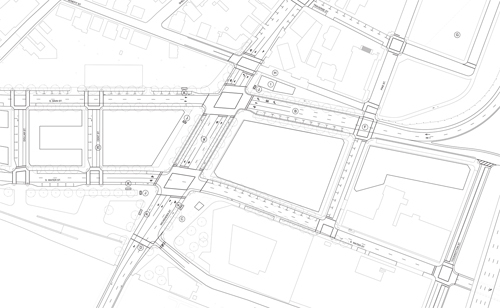 This is the third of a series of posts we will be doing about the 195 Street Grid. To view all the posts and more information, please visit our 195 Relocation Project page. 11:30PM Aug 18th: Link to the PDF of the updated draft isn’t working…? Excellent proposal designed by L+A Landscape Architecture. This is a sensitive response that would restore urban dignity to Fox Point’s gateway. The one block boulevard is refreshingly un-American. Also reducing the number of lanes on Wickenden between South Main and South Water will reduce the bottleneck effect on Wickenden towards Traverse and Brook Streets. Perhaps the crosswalks at this intersection could be divided in a hierarchy to separate pedestrians, cyclist, and stopped cars. RIDOT may take issue with “F” the Pike and South Main intersection due to their fear of traffic backing up onto the highway. If there’s any room it would be great to expand the exit ramp lane progression from one to two to three lanes by the time the proposed “F” intersection is reached from the highway. This is a very thoughtful plan and hopefully they’ll buy into it. I would assume (and this is just an assumption) that any work for future traffic lights at this point would be for temporary roadway configurations. We should see quite a bit of movement of traffic patterns in coming months as the last of 195 traffic moves to the Iway and the old highway starts coming down. But, this is just an assumption on my part. New traffic lights being put up this morning, I’ll get pictures today during lunch if I can.